2 Bedroom Apartment with a private roof top sun terrace and south facing front balcony, so ideal in Winter months. WIFI is available. There is ample room for parking and is within easy walking or driving distance for a number of local beaches. The famous Mar Menor (or little sea) is about 25 minutes walk away (3 minutes by car). This is a fantastic place for water sports, swimming and good beaches, there are no tides so very very safe for swimming and is much warmer than the sea. Also there are lovely sandy beaches in Lo Pagan. The area is very flat so it's perfect for cycling or walking. Very close to the San Pedro Las Salinas national park, an unspoilt nature reserve which is a favourite with bird watchers! The local town is about 15 mins walk and the motorway is about 1.5 miles away. The local airport (San Javier) is only 15 mins drive and is very easy to find to/from apartment. There is a regular bus service to neighbouring towns for non-drivers, and the bus station is only 10 minutes walk away. I have had my apartment in San Pedro for a number of years and bought it from new. I love San Pedro and spend as much time there as I can. I love being near a Spanish town and yet so near to the sea and every amenity you could need is within half an hour. I live in Yorkshire which is beautiful so I have the best of both worlds! Because it's South facing, great views of the sea from roof top terrace and near a lovely Spanish town which gives you a great Spanish feel without being remote. WIFI is also available. The area is very flat so fab for walking or riding a bike in very safe bike lanes plus wonderful food, what more could you ask for when living in Spain! My property has all mod cons, WIFI a very well equipped kitchen as I used to have a Restaurant nearby. Air con which is a must in the summer, English TV, and well equipped private solarium ( private roof area ) with lovely views of the sea, new loungers and chairs, Great for alfresco dining the solarium can be lit up at night.The swimming pool is looked after to a high standard and has plants, loungers and gazebo's. Bathroom with hand wash basin, bidet, toilet and bath complete with shower over and plenty of drawer space for toiletries etc. This is our second visit to Annita’s Apartment and i would not hesitate to recommend it. The Apartment contains everything you need and more, is extremely comfortable and light and airy. We loved having breakfast, sometimes our evening meal, or just a drink on the balcony or up on the Sun Terrace. There are great restaurants, coffee shops, bars, shops and supermarkets just a short stroll away. We hire bicycles for two weeks and literally potter around visiting local places, walking, swimming in the pool or sea, eating, drinking and having mud baths !!! If you want to travel further afield, the Bus Station is a 15 minute walk away and there is a good and interesting service. Pete and Sue who look after the Apartment are lovely and nothing is too much trouble for them. Thank you for another fantastic holiday. Lovely property, hence our 2nd stay there. Annita's apartment was great for the 3 of us, plenty of room and well kitted out. Although we only used it as a base we could've easily used it as a home from home while we were there. I'm sure we'll return. And thanks to Pete for his service. Sooo glad you enjoyed my little jewel in the crown! Look forward to the next time. Clean, well equipped and quiet. We enjoyed a few days here. Roof terrace was a real bonus. Car hire advised if you want to see the area. Pete very helpful. We would stay again. The flat , especially the kitchen, is very well equipped: there's a safe, an iron and ironing board and an efficient shower. Really very easy to live in, though a large number of keys to work out (all very high security). The roof terrace is private, with a view of the sea in the distance. The swimming pool was sadly out of commission for the whole of my stay, but the sea and salt lakes are not far away and there is a beautiful walk through scrub to a big empty beach. The surrounding village is a little bleak; Lo Pagan, the next along, is more vibrant, with plenty of bars and restaurants. Hire a bike and you'll be there in no time. Pete and Sue were very friendly and helpful as was Annita in the UK. I would happily come again. Sooo pleased you enjoyed your stay Emily and you managed to get out and about. It is really lovely biking here as it's so flat and safe with the bike lanes. It was unfortunate that the pool had some maintenance work on, but it is back to normal now. I love the solarium here it's so private and peaceful and a great suntrap! Sooo glad you enjoyed, it really is a lovely time of year to be in Spain, especially to get the extended daylight till 6pm! The area is especially suited to those who enjoy walking, cycling, bird watching or just relaxing by the pool or sea. Very close by is the 4 star Thalasia hotel which offers an abundance of Spa treatments at a reasonable cost. The beach is approx. 20 minutes on foot, 5 in a car. Fabulous for walking and biking as it is very flat and has excellent cycle lanes. Great bird life on the salt flats including Flamingos. The Port is about 20 mins walk and provides a lovely harbour with yachts and nice bars and restaurants etc. In fact there is everything you could ever need within half an hour by car. 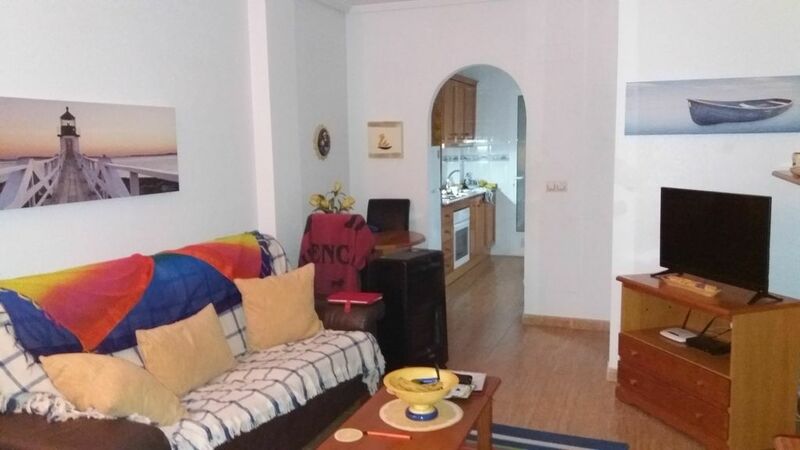 The nearest airport is San Javier which is approx 6 miles away and can be easily reached via motorway or main road and takes about 15 minutes from apartment to airport. Car hire, whilst not essential can be useful to see the wider area including neighbouring towns and cities. There are many local supermarkets, banks and restaurants in San Pedro that can be reached on foot or in the car. Also a good Market on a Monday. Great fiestas on appropriate days, San Pedro is a very nice Spanish town. So you have a good cross section of all you would need here and in the surrounding areas.